Savannah, Georgia, 1904. "Colonial Park Cemetery." By the looks of it, in need of a trim from the Grim Reaper, or at least a spritz of Roundup. View full size. Submitted by TimB on Fri, 05/26/2017 - 7:14pm. Hey, we got lucky with Google, who gives us nearly the perfect angle. I want to believe that the shrub growing 113 years ago is the mighty tree just about in the right spot of the modern view. Submitted by jimmythekid on Fri, 05/26/2017 - 6:33pm. 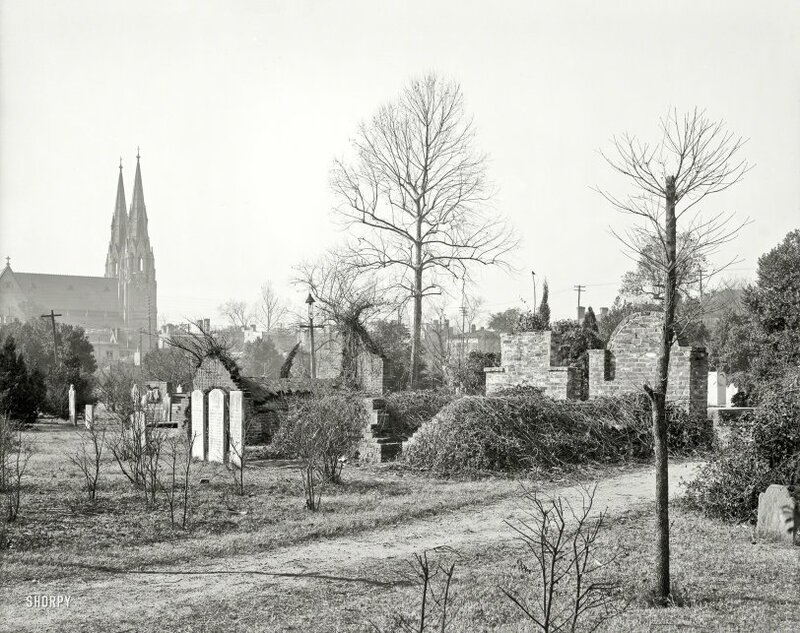 I believe the photographer caught a logger-headed shrike perched atop a twig in the center of his photograph, surveilling the cemetery for prey 113 years ago. It's silhouette and stance are correct to that species. It's a song bird which evolved into a hunter with weak talons, and so impales grasshoppers, mice, or small bird on thorns or bared wire spikes to tear them apart . . . apropos to the subject matter, I suppose.